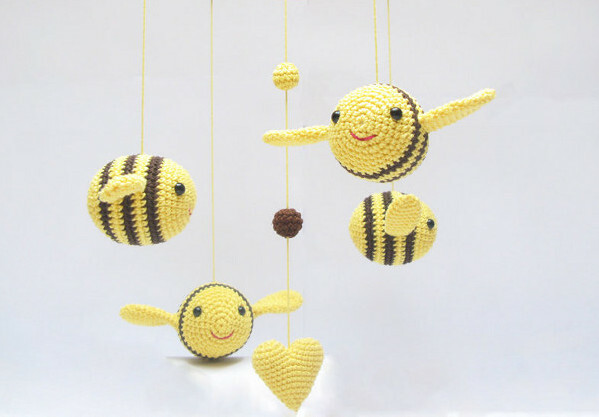 Unique baby mobiles are becoming harder and harder to find, so we’re thankful for the showcase of talent that is Etsy. It’s among the artisans and crafting types here that we’ve found most of our enchanting baby mobiles. 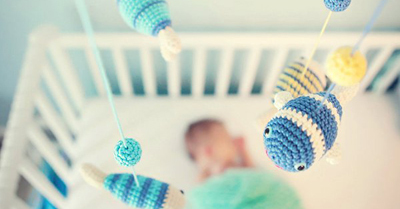 Click on through to see a round up of baby mobiles we’ve featured in the past year. 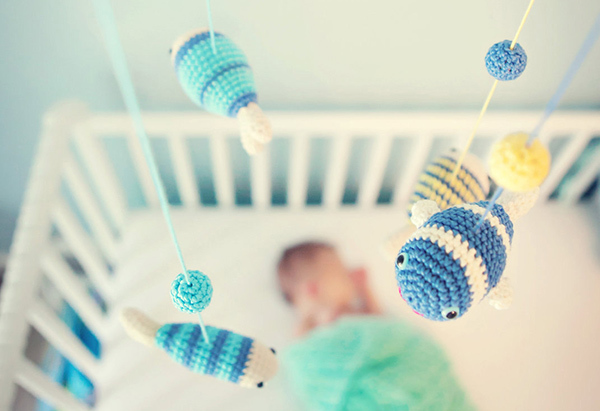 Nora Docheva is an extraordinarily talented at both knitting and crochet, her baby mobiles are truly constructions of beauty and charm. You can find a menagerie of animal mobiles including elephants, dachshund puppies and even whales at her Etsy store LalaKa. 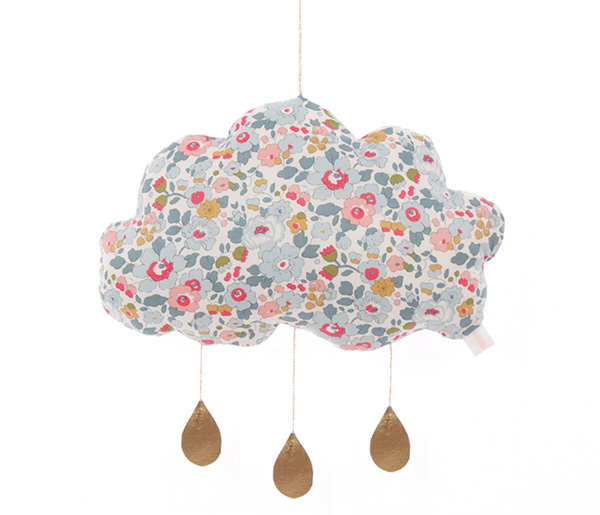 Vintage and those who are fans of all things roses and romance will adore the Liberty fabrics used in creating UK-based Little Cloud nursery mobiles. Clouds with dainty metallic raindrops and moon and star mobiles are plentiful in a large selection of timeless Liberty of London fabrics. See all that’s available at Little Cloud. Felt is making a major comeback in decor and decorator pieces, and nursery mobiles are no exception. 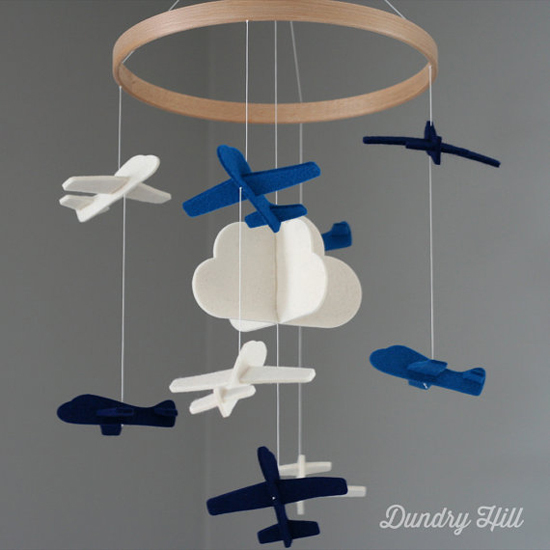 This gorgeous airplane mobile will have your little one’s imaginations flying sky high. It’s here at Etsy store Dundry Hill that you will find not only airplanes of every colour, but birds and hot air balloons too, all made from beautiful quality pure Merino wool felt. We had many a reader ooh and aah over the crochet offerings from Cherry Time. Those busy buzzing bees certainly created a buzz on our social media pages! 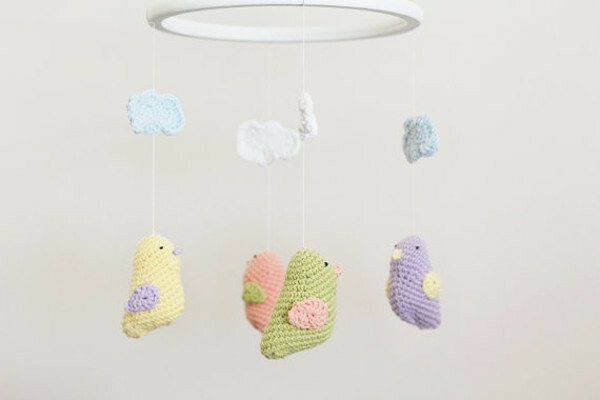 Cherry Time have more than 20 mobiles available including crochet fish, baby birds, fish and butterflies. 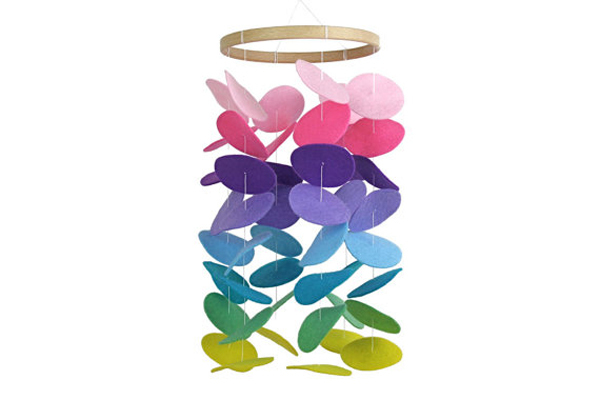 Be razzle dazzled by a sea of coloured felt discs with this sublime rainbow baby mobile. Also on offer are puffy white cloud mobiles and some rather marvellous felt blend pompom arrangements. See the whole collection at Etsy store Little Nest Box. 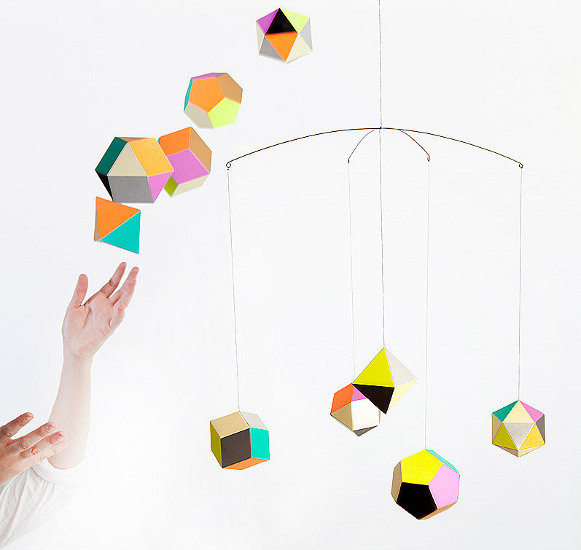 And finally if it’s a modern mobile you seek, this Artecnica Themis Mobile fits the bill perfectly. Beautifully bold in neon and pastel colours, I’m sure adults as well as babies could lose time watching these paper shapes bob in the breeze. For more baby mobiles, see our previous baby mobile roundup post from last year.